A sophisticated scene-setting lighting-control system that’s easy to install, easy to use, easy to maintain and requires no commissioning. 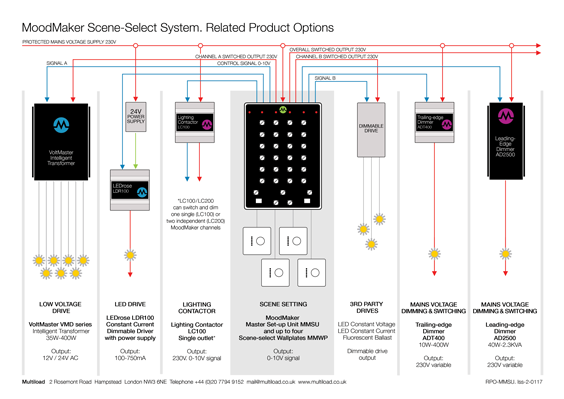 Bringing a fresh approach to lighting controls, MoodMaker Scene-setting System enables the user to be in complete control of any installation with its intuitive, simple-to-use control panel. 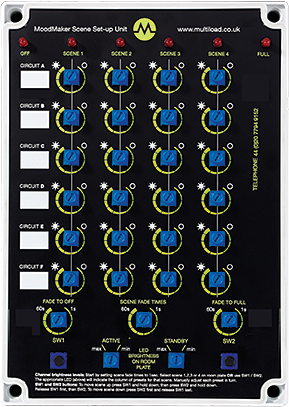 It provides a choice of six scenes, comprising four moods plus full ‘on’ and ‘off’, for any number of lighting channels or circuits, with extremely smooth dimming and fading. Used to increase the number of channels for the system, with up to six additional channels per Auxiliary Set-up Unit.